Bethlehem University hosted a lecture for the renowned Maltese Literature Academic, Dr. Norbert Bugeja, on Friday, 11 May 2018, in cooperation with the Representative Office of the Republic of Malta. Brother Peter Bray, Vice Chancellor, welcomed the Representative of Malta to Palestine, His Excellency Mr. Reuben Gauci, and said that the university is open for cultural exchanges. The lecture, entitled “Journeys in Writing: Malta, Palestine and literatures in between”, addressed the thematic and discursive itineraries of Malta’s post-Independence poetry, with a focus on the work of some of the major exponents within the Movement for the Revival of Literature (Moviment Qawmien Letterarju) writing in the 1960s, 70s and 80s. Dr. Bugeja compared the works of some Maltese authors with their Palestinian counterparts like Mahmoud Darwish, Ghassan Kanafani, Fadwa Tuqan, Mourid Barghouti, Samih al-Qasem and others. 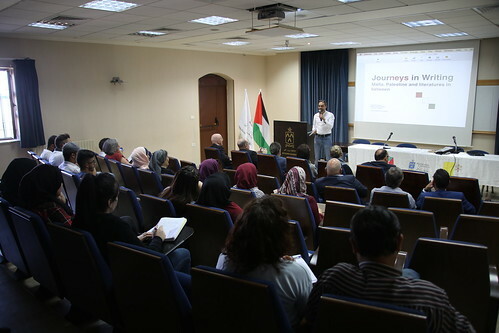 Bethlehem University has previously hosted a literary conference for the Maltese Palestinian author, Walid Nabhan, and Moroccan poet and professor, Dr. Adrian Grima, in 2017.